These nutty, sticky, chocolatey balls are just delicious and one or two really is enough to beat your chocolate need. They are full of fibre, thanks to nature’s own fudge, the date, and contain all the goodness of coconut and almonds too. Whizz up a batch of these to see you through the week, whether it is a late night sofa snack, or a healthy alternative to that cake that’s going round the office. 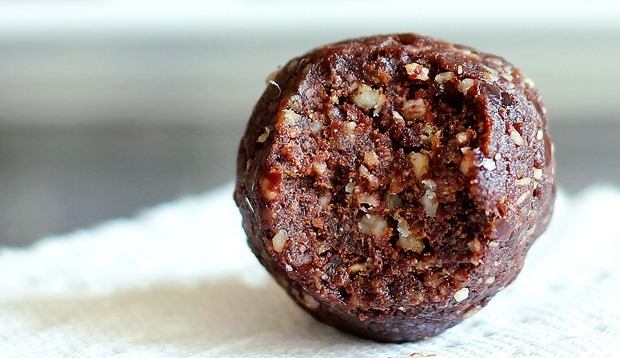 Blitz the dates, coconut, almonds and cocoa powder in a food processor until combined into a sticky, smooth mixture. Prepare a tray lined with greaseproof paper and roll small balls of the mixture, spreading them out over the tray. Once you’ve done this, chill the balls in the fridge for a few hours. When they are chilled they should firm up. Melt your dark chocolate, and for the ultimate finishing touch, roll the balls in the melted liquid before returning to the tray to set in the fridge. Indulgent, healthy, yummy, what more could you want.